Porcupine Tree have posted a live video of the band performing "I Drive the Hearse" from the Chicago performance found on their upcoming two-disc set, Octane Twisted. Steven Wilson on Collaboration with Opeth's Mikael Akerfeldt: "No Distorted Guitars"
It looks like the long awaited project from Opeth mainman Mikael Akerfeldt and Porcupine Tree guitarist Steven Wilson has now completed its first album. GuitarWorld.com is excited to be able to bring you the exclusive premiere of the new music video from Steven Wilson, "Remainder the Black Dog." You can check out the video below. 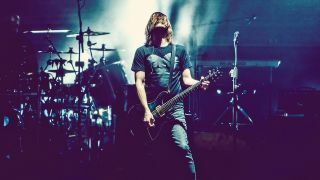 Porcupine Tree guitarist Steven Wilson discusses recording with Blackfield and as a solo artist. The Porcupine Tree frontman joins forces with the Israeli mega-star for their third album as Blackfield.